VANCOUVER PREMIERE – Arya and Jacob were both born in Saskatoon and have been best friends since high school. Arya’s father is Iranian and his mother is Irish-Catholic. Jacob comes from a long line of rabbis. The unlikely pair laugh at their respective cultural differences; dubbing themselves ‘the Jew and the Muslim’. As they grow up, their own spiritual journeys lead them in divergent directions that will change their lives forever. 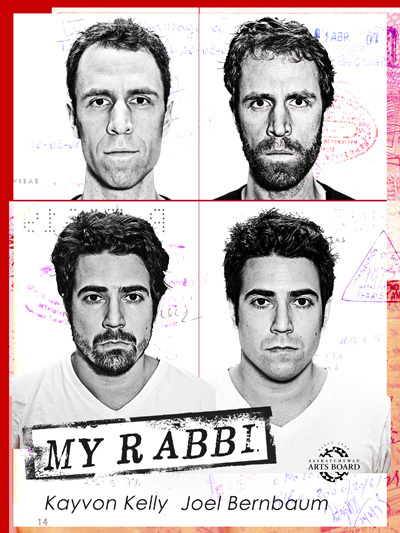 This thought-provoking comedic drama about the lines that occur between faith and friendship is created and performed by real-life friends Kayvon Kelly (Chelsea Hotel) and Joel Bernbaum. Written and performed by Joel Bernbaum and Kayvon Kelly. Directed by Julie McIsaac. Dramaturgy by Michael Shamata. Lighting Design by Bryan Kenney. Stage Management by Erin Crowley. Free to attend – join the conversation! Free & open to the general public, regardless of whether you are seeing the show that afternoon.